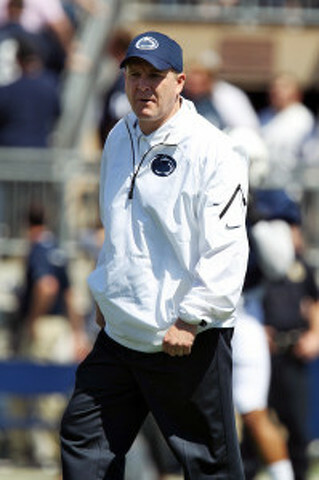 Penn State defensive coordinator Bob Shoop. Photo by Big Ten Network. It’s Whiteout Friday and defensive coordinator Bob Shoop is in the same head-to-toe blue sweats he often wears on the Penn State practice fields. Kickoff against Ohio State may still be 30 hours away, but Shoop already has his game face on. As he slowly walks through the oversized second-floor lobby of Lasch building, Shoop nods in recognition of a visitor, his face half-grimace and half-grin. He looks in a bit of a daze. With apologies to Jay Z, Shoop is in a J.T. Barrett State of Mind. Shoop goes over to the drink counter, makes himself a cup of 2 o’clock wake-me-up coffee, pads through the lobby and heads back down the hallway to his office. It's the ultimate Man-Up Cave. That’s where he’s really at home, using his B.A. in economics from Yale to plot the Nittany Lions’ defensive game plan. Well, that’s not entirely true. He’s also at home in the press box, calling schemes; in the film room, breaking them down; and on the practice field, teaching them. At one point, there was a very outside shot that Bob wouldn’t be the first Shoop from Oakmont, Pa., to work in Lasch. John, his younger brother by three years, is currently the offensive coordinator at Purdue. But the bulk of John’s coaching experience is in the NFL, with Oakland, Tampa Bay, Chicago and Carolina. Mostly, John was an offensive coordinator and QB coach. From 2007-11, he was the offensive coordinator for the University of North Carolina. Ultimately, the search committee hired a guy with those credentials. Guy by the name of Bill O’Brien. And OB’s departure after two seasons in a not-so-Happy Valley opened the Lasch doors for a Shoop, after all. Bob Shoop. James Franklin brought along as many as 16 coaches and staffers from Vanderbilt. That Shoop rode the figurative shotgun on Franklin’s 697-mile journey from Nashville to State College has resulted in the biggest on-the-field impact since Franklin was hired in January. The numbers tell the story. The NCAA released its weekly FBS statistics early Sunday morning and the Nittany Lion defense was in the Top 7 in eight key defensive categories. That 7 is definitely a lucky number for Penn State’s hobbled offense. The rankings are below; 2014 is first, followed by the final national rankings and numbers for 2013. 1st -- Rushing yards allowed, 86.6 per game (2013: 36th, 144). 3rd -- Total defense yards allowed, 267.6 per game (2013: 48th, 381). 3rd – First downs allowed, 14.7 per game (19th, 19.4). 3rd – Opponent passing efficiency, 100.03 (50th, 123.3). 6th – Points allowed, 16.6 per game (59th, 26.2). 7th – Fourth down conversions, 20% (32th, 42.9%). 8th – Third down conversions, 30.4% (39th, 36.5%). Here’s another number for you: In six Big Ten Conference games in 2014, the Nittany Lion defense has given up just 86 points in regulation time and scored 6 itself (on an Anthony Zettel pick six against Michigan). That’s 80 points net – or 13.3 per game. It’s not all Shoop. Also led by co-coordinator and assistant head coach Brent Pry, Penn State’s most concentrated coaching experience is on defense. You can also include 20-year coaching vet Sean Spencer, who has maintained Penn State’s D-line legacy, and the only Penn State grad on the staff, cornerback coach Terry Smith – a high school and college coach for 18 years. Ultimately, it’s the players. The Nittany Lions have a swarming group of defenders that does whatever Shoop tells it to – including pitching a defensive shutout of Indiana and holding national rushing leader Tevin Coleman under 100 yards on Saturday. The leader of that group is fifth-year senior middle linebacker Mike Hull, whose 99 tackles on the season – 11 per game – rank him ninth in all of major college football. Hull and Shoop huddle, as a diabolical pair of sorts, early each game week. The pupil offers his input, then learns from the teacher so he can then be an on-the-field peer counselor. Hull is on his sixth defensive coordinator in a half-decade at Penn State. He’s a man of few words, most comfortable around numbers as a finance grad, solitude as a fisherman and a few fellow fifth-year guys as a close friend. In each of those circumstances, his actions speak louder than words. Just not when discussing his mentor. Hull’s fellow linebacker, sophomore Brandon Bell, also has a laconic bent. But Bell is also not hesitant to give the blitz-happy coordinator his due. Penn State is the latest on a 13-stop tour of college football for Shoop. That includes three stays at Yale – as a two-year undergrad starter at wide receiver, as a grad assistant and as the defensive coordinator. That’s one more line on his resume than his boss Franklin has. Of course, Franklin being the classic over-achiever, is six years younger. Shoop’s list of employers reads like an NE Corridor schedule for Amtrak: Yale, Virginia, Northeastern, Yale (again), Villanova, Army, Boston College, Columbia, UMass, William & Mary, Vanderbilt and Penn State. It’s likely that Shoop will move on to his next stop before Franklin. Shoop tasted the head coaching world in his 30s, regrouped and is now gaining national prominence for the Nittany Lions’ success, and not the Columbia Lions’ failure. When Shoop took over as head coach at Columbia in 2003, he was a boy wonder, having just turned 37 a few weeks before the season opener. It started out OK, with Columbia going 4-6 that first year. But after 1-9 and 2-8 seasons, Shoop was shown the back stoop. Fired and not yet 40. His punishment? Back to being an assistant. And not even at the major college level. He spent 2006 as the secondary coach at UMass. The Minutemen went 13-2 and lost to Appalachian State in the FCS championship game. Three of Shoop’s DBs were named all-conference, two to the first team. A spoonful of sugar helped the medicine go down. His reward? The defensive coordinator’s job at William & Mary. More responsibility, but at first it seemed more like a punishment. In 2007, Shoop’s first season in Williamsburg, W&M ranked 111th in the nation in points allowed, yielding 38.8 per game, and 84th in total defense. The numbers were more than halved in 2008, when the W&M defense was ranked 55th and 37th, respectively. And respect was coming. The reward came the next two seasons. In 2009, William & Mary’s defense was No. 1 in fewest points allowed and No. 2 in fewest yards allowed. In 2010, W&M was ranked No. 6 and No. 30. Shoop’s reward? A phone call from Franklin, who offered Shoop the defensive coordinator’s position at Vanderbilt. Off he went. And another defense took off. Vandy was in the Top 25 for total defense each of the three seasons Shoop and Franklin were there – 18th (2011), 19th (2012) and 23rd (2013). Now, at Penn State, Franklin and Shoop are among the first to arrive at Lasch early each morning. Franklin because he cartwheels out of bed and loves what he does, loves who he does it with. Shoop loves his job, no doubt. And he has extra time. 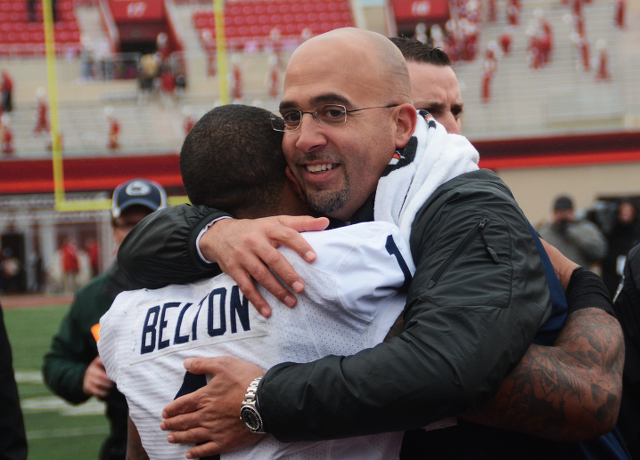 The ones he loves – his wife and two sons – have not yet moved to State College. No one seems to be more appreciative of Shoop’s presence than battered Nittany Lion quarterback Christian Hackenberg, who’s been sacked 35 times – sixth-most in all of college football in 2014. If John Shoop had somehow ended up at Penn State instead of O’Brien, Hackenberg certainly would not have become a Nittany Lion (no offense, John). Finally, a Penn State running back surpassed the 100-yard mark in a single game this season. Bill Belton, the Nittany Lions’ senior feature back, amassed 137 yards on 16 carries, his fourth career 100-yard game. Ninety-two of those yards came on a late second quarter touchdown sprint.